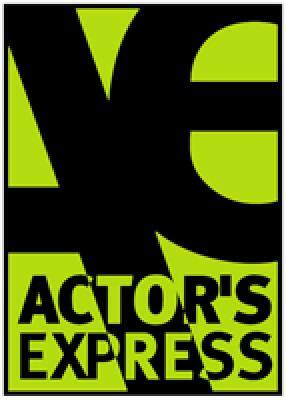 Actor’s Express doesn’t put on bad shows. Misguided sometimes, but never incompetently unprofessional. "Little Shop of Horrors" fits the run-of-the-mill bill for Actor’s Express. There are good elements and so-so elements, not adding up to anything special. Let’s start with the set, designed by Isabel & Moriah Curley-Clay. It’s impressive, with lots of nice touches -- a "free electricity" sign near an outlet, a clock that moves to the times mentioned in the play, window coverings that roll up as the Mushnik florist shop opens for the day. But the shop is a big square with audience on two sides, and the right angle at the downstage corner presents severe sightline challenges for scenes taking place when the florist shop is closed. A curved corner would have allowed at least three precious feet of additional room for these scenes (but would have complicated the window covering mechanism). Heather Schroeder’s props don’t include any particularly good-looking flowers, and the trick hand for Seymour’s pot is glaringly obvious in the close quarters of Actor’s Express. Erik Teague’s jacket to hide Seymour’s arm in this scene is likewise clumsy. Otherwise, costumes work well for the major characters. For the three "urchin" backup singers, though, the outfits are equal parts glamorous and tacky. Ryan Bradburn, the puppet designer, has an easier job than in most productions, with the big Audrey II plant capped by a visible Kandice Arrington. The puppet itself flaps runners like floppy legs and occasionally widens its labia dentata opening, but its growth is represented only by Ms. Arrington standing up taller. She has a terrific costume, and being able to see her lips moving helps the understandability of her lyrics, but the explicit anthropomorphizing lessens the impact of the ending. Rick Lombardo has directed his major actors to give somewhat mannered performances and hasn’t inspired his ensemble and trio players to give very involved performances. Of the minor players, only Abby Holland impresses with her acting choices. Juan Carlos Unzueta’s performance as Seymour is broader than it need be, and his hairstyle is more modern than the supposed time period of the show. He has a lovely tenor voice; unfortunately, Seymour’s song are too much in the baritone range to show his voice off to advantage. William S. Murphey invests Mr. Mushnik with a lot of energy, but is directed to give animated cartoon villain sounds on one exit. Clint Clark works hard as Orin, but doesn’t have a naturally charismatic comic presence that would really make his performance succeed. Kylie Brown shines. She uses a mannered style of singing for Audrey, but she lets the sweetness of her character shine through every word and reaction. Amanda Wansa Morgan has gotten good vocal performances out of everyone, and Angela Harris does about as much with choreography as the right-angled alley playing space allows. Joseph P. Monaghan III’s lighting design keeps things visible (despite an over-use of stage fog), and the sound design by Angie Bryant and Adam Howarth keeps things audible and balanced. It’s all professional, but it’s not inspired.